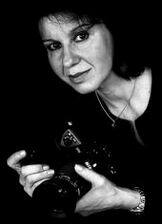 Welcome to the pages of Dagmar Pavlíková. I was born in Prague in January 1963.
and in the old parts of Prague. Among other, he was in flames fascinated amateur photography. He has just given me my first camera Flexaret IV, and thanks to him, I have fallen for wandering about and above all photography. and friendship and so I have been affected in my art tendency. photo-studio with a view to the reportage, publicity and the technical photograph. and portraiture. I have made photographs by clasical or digital way. My used cameras - Nikon and the panoramic cameras Hasselblad XPan and Noblex. Most of my time I devote to make the mentioned panoramicphotographs. Some of those large-size pictures are as decoration of the luxury offices and the most different lounges. There were aranged some author expositions and exhibitions too.